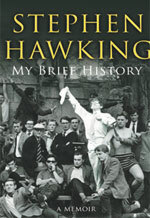 My Brief History covers Hawking’s early life in London and St Albans, his student years in Oxford and Cambridge, and the onset of motor neuron disease shortly after his 21st birthday. Hawking writes about his two marriages and his pioneering work in the field of quantum cosmology. 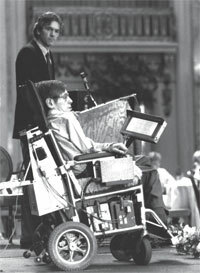 Once a tutor made Hawking read the Bible, intending to open his student’s mind to the beauty of the English language. This ploy backfired when Hawking complained that many sentences started with “and”; they were against the principles of good English. The tutor replied that the language of the Bible was outdated. In that case, Hawking asked, why was he being made to read it? Early on in graduate school, his deteriorating physical condition steered Hawking away from experimental research, since he couldn’t do the necessary hands-on work. But concentration was not easy. Hawking dismisses stories that he drank heavily at that time. “They are exaggerated. Once one article said it, other articles copied it because it made a good story, and eventually everyone believed that,” he writes.